What was new with the 1990 issue? What did Red Rose do in 1990 to resurrect interest in the cards? Well, like they did in 1959, they did a media blitz. The grocery store was another place where it was clear that Red Rose was bringing them back. 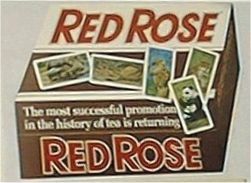 Shown here is a fold-out "box" of Red Rose proclaiming "The most successful promotion in the history of tea is returning." It comes in both English and French versions. This store promotion had some interesting facts inside for the grocer. It spoke of distribution in the product. There was supposed to be 1 card in 36's and 48's, 2 cards in 72's, 3 in 144's and four in 216's and 250's. It mentioned that the album cost $1, that the cards are educational and fun to collect. It also states that "For seventeen years (1959-1975) over one billion cards were distributed - there were over half a million card collectors across the country. Sales of Red Rose Tea grew dramatically, during this time Red Rose's market share grew by over 50%." 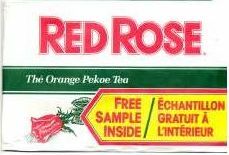 Another cool happening that was touted in the promo was that in September of 1990, Red Rose planned to issue 200,000 sample packs to households and they would be made up of a free collector's album, two picture cards, six Red Rose Orange Pekoe Tea Bags and a 50 cent or $1 coupon. You've never seen the sample pack? Well, look right here. I am sure there were many other things going on like commercials and other types of promotion. What was missing this time? they mailed anything out to the schools of Canada as they did with the Brooke Bond promotion. any completion cards were produced. any free album coupons were produced. So that is my take on what's new and what was missing. What's your story? Email me. Click the link below.